The event will be held Friday, Feb. 12. The Titans of Mavericks website went from red alert to green on Tuesday. The world's premiere big-wave surfing event competition, Titans of Mavericks, is set for Friday. The officials that decide when to hold the surf contest, as expected, made the call Tuesday afternoon summoning the world’s best big-wave surfers to the famous surf break off Pillar Point north of Half Moon Bay, about 20 miles south of San Francisco. "The Call Alert: The Event is On!” the alert reads against a green backdrop on the Titans website. The one-day event will be held Friday, Feb. 12. The contest is held only when surf conditions are suitable, so while it has happened in 2014 and 2013, it did not happen last year or in 2012 and 2011. Massive waves last week had the Committee 5 poised to pull the trigger, but blackout dates surrounding Super Bowl 50 in nearby Santa Clara stood in the way. The conditions were perfect for the contest, with 20- to 40-foot surf and warm temperatures. National Weather Service forecasters are predicting waves between 13 and 14 feet on Friday but waves could reach up to 25 to 30 feet, with the occasional breaker hitting the 35-foot mark. The Mavericks surf contest is an invitation-only event in which the world's top surfers are notified about 48 hours in advance that conditions are right. 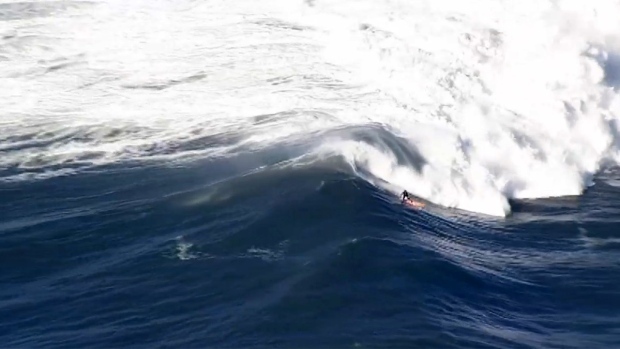 This year, 24 surfers worldwide have been picked to take on the massive swells off of Half Moon Bay. The contest was founded in 1999 and typically draws thousands of spectators to the area, even though they're not allowed on the beach or nearby cliff. Fans can watch live streaming video via RedBull TV. Associated Press and Bay City News contributed to this report.